We had to pay for our own drinks and GG and I chose a delightful chardonnay, then each selected a complimentary entree and mains. One thing I’ll note here before I launch into my musings was that this was their first night after reopening so I’m not sure it was the best reflection of how they will be operating with a few weeks under their belt and as some of their new staff find their groove. I considered the evening was more a learning curve for them, so was willing to forgive a lot of the confusion that seemed to go on throughout the night, primarily relating to the timing and delivery of meals to our group. So moving on, GG and I decided on two entrees to share and went with the Bush Pepper Calamari (A generous serving of spiced calamari, flash fried and served with garlic aioli – $13.95) and also the Prawns Australiana (Sautéed prawns, tails on, smothered with creamy garlic sauce on a bed of rice, served in a mini camp oven – $17.50). So how were they? 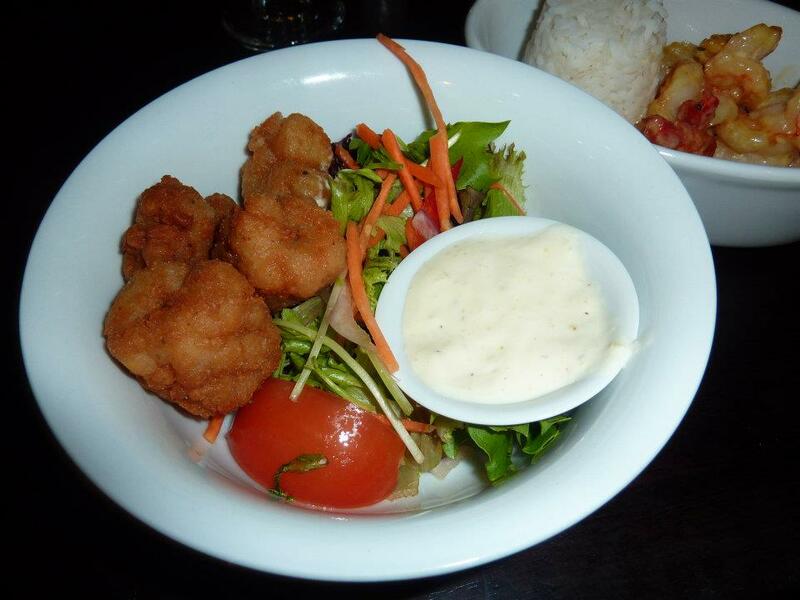 Well the calamari was tasty enough, but it didn’t taste like it had been made fresh, more seemed to me to be something originally frozen and then deep fried, and it was a fairly small serve for the price and the same was definitely true of the prawns. 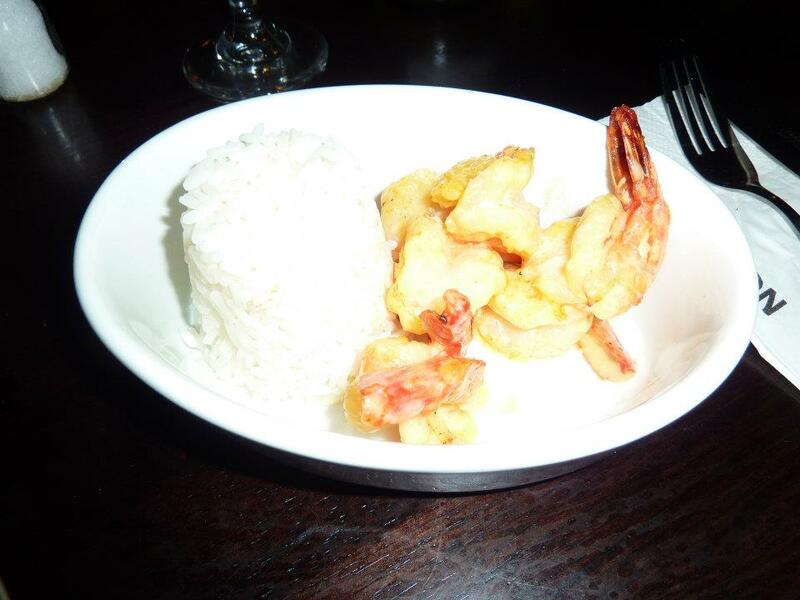 Yes they were cooked well and taster fresher than the calamari, but 5 or 6 prawns for over $17 seems like a lot. The creamy garlic sauce they were served with was nice though. The rice was a little on the al dente side. With a group of 20 is always going to be slightly challenging to time the arrival of the entrees all together, but some people were already moving along to their mains before their entrees seemed to have arrived for others. But I am confident in time that this will improve. For our mains I decided to see how the Northbridge Sparrows (Prime 300g Rump, minimum 100 day grain fed, seared to perfection – $26.95) compared with the one I’d had in Rockingham. Again I asked for a pepper sauce on the side, pepper sauce and steak just makes good sense to me. 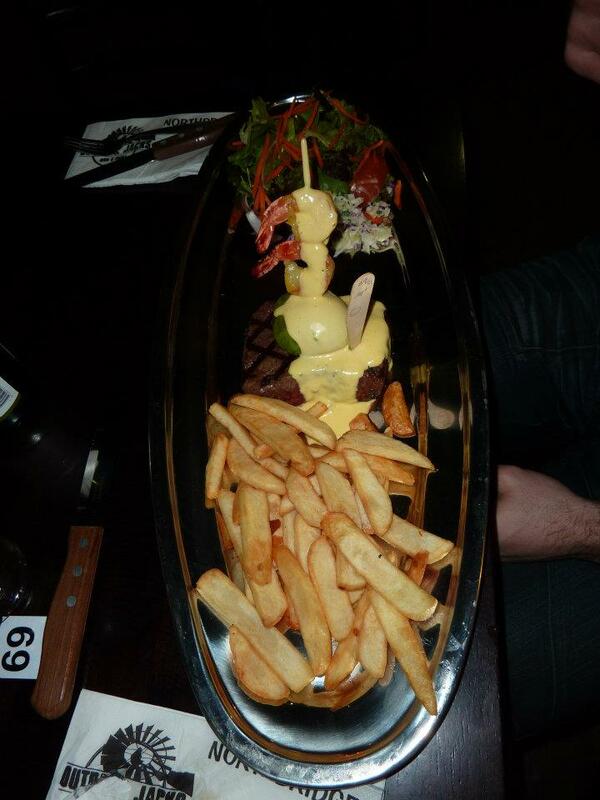 GG went for something different and ordered the Neptunes Steak. 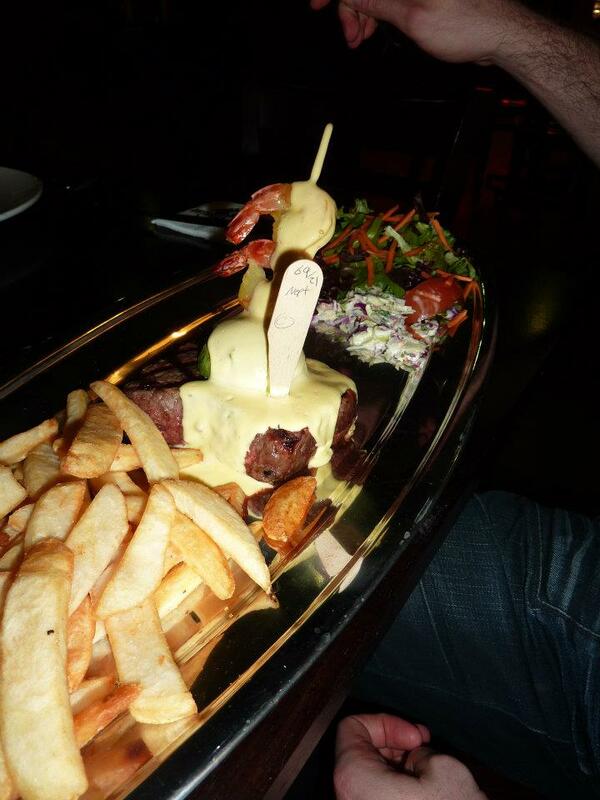 (Prime 300g Rump, minimum 100 day grain fed, flame grilled, topped with sliced avocado, grilled prawns and bearnaise sauce – $33.95). A surf and turf of sorts. GG’s meal arrived first and I snacked on his chips that were supposed to be a baked potato but hey first day mistakes. And I was a bit peckish by this time so was grateful for them being there. The real issue with GG’s meal was that his steak was cooked medium rare as requested but temperature wise it was barely warm…. bordering on cold. I was pretty impressed he managed to eat it all really. So needless to say I was a little nervous about my meal after having seen GG’s. And I waited and waited and waited….. and was the second last person to receive their mains after several were brought out that didn’t actually seem to belong to anyone on our table….. so there was more than a little confusion and some frantic waitstaff flitting about. But hey it finally got there. Temperature wise my steak was a lot hotter than GG’s, which I was very happy about. The chips were decent, as was the pepper sauce. I probably just wasn’t as wowed by my meal here as I had been on the other visit to an OBJs. Could have been that I had been snacking on GGs chips while I waited for it to arrive and I’m just not sure how hungry I was by the time it was presented. So I wouldn’t say my first visit to OBJs Northbridge is one that would have me rushing back but I put a lot of that down to initial teething problems and a very new group of staff. 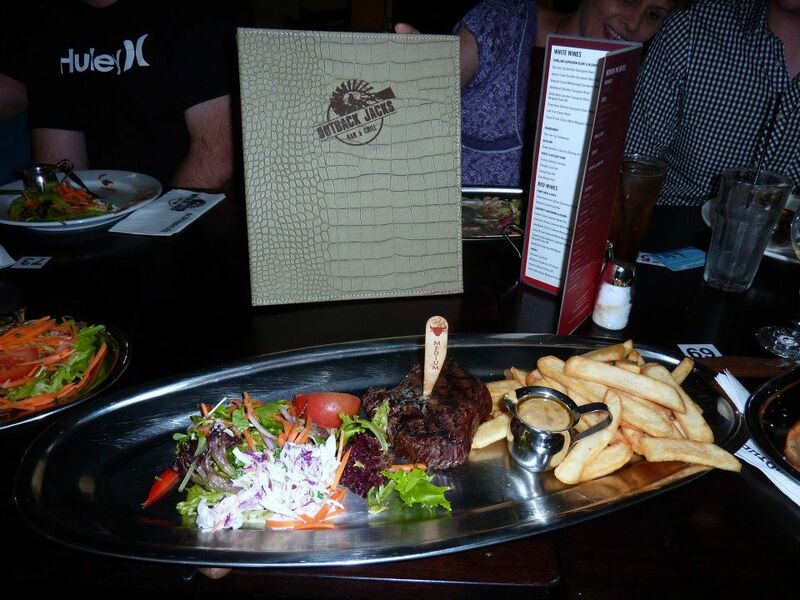 As a steakhouse chain I think OBJs have a solid menu that will keep the majority of steak enthusiasts smiling and also ticks the box for being family friendly with their kids room. So thanks to Tweetperth for the opportunity to check it out and I’m sure in time and with a bit more practise that OBJs will get there.